Bright Shiny Object: A Brutalist building is reinvented as prime office space with a glossy new skin. Indicate the reasons the design team of Five Manhattan West opted to employ a pleated facade. 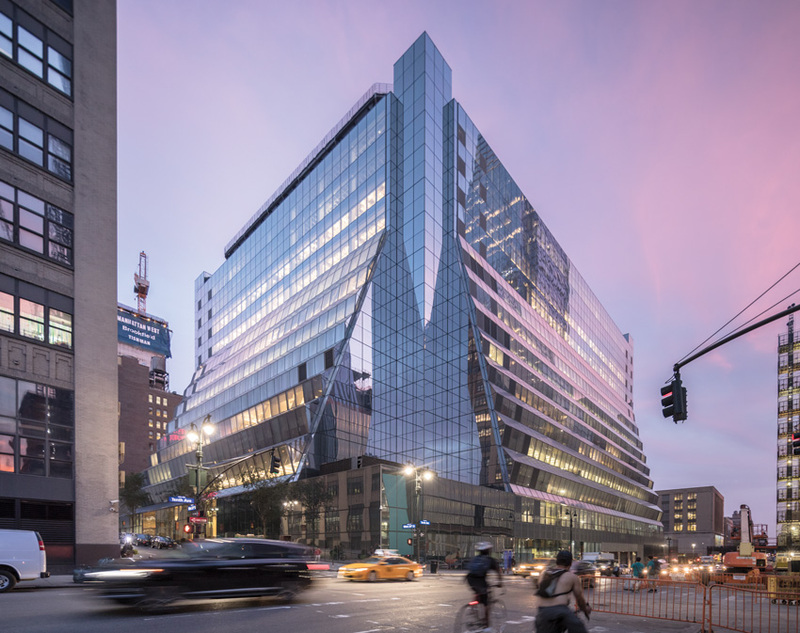 Identify the type of curtain wall system used in the reskinning of Five Manhattan West. Describe the advantages of using a “spreader bar” system for installing the new curtain wall. Debate the pros and cons of reskinning buildings from the Brutalist and Postmodern eras in glass. 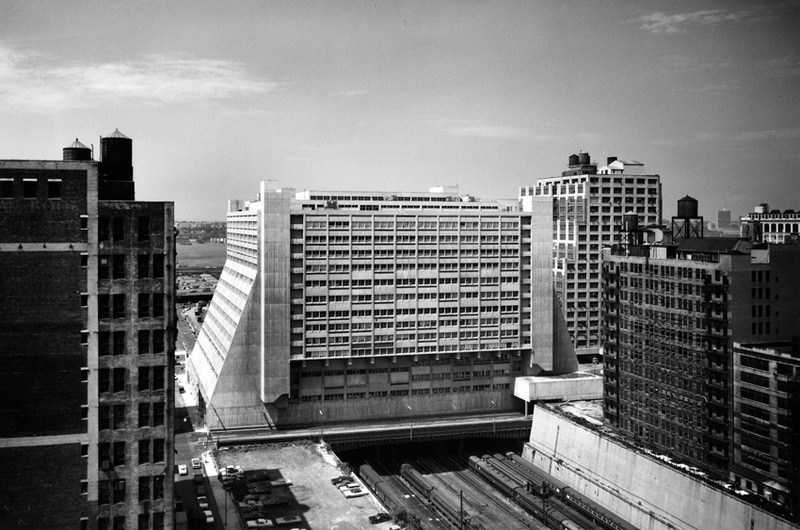 Even before it was built, plans for the Westyard Distribution Center in Manhattan were heralded, with a December 18, 1966, New York Times headline reading “Project Combats Lure of Suburbs.” The article referred to the 15-story building’s more than 32 acres of rentable space, spanning 220 feet like a bridge over Penn Station’s active rail lines, as “an urban rebuttal to arguments for landscaped suburban warehouses.” Upon completion in 1969, the concrete-clad, ziggurat-like design, by Davis Brody & Associates (now Davis Brody Bond) was generally well received, a rare Brutalist structure to instantly garner praise. At the time, RECORD called it “a confident giant standing astride a broad valley.” The magazine pointed out that “a planned 65/35 percent industrial facilities/offices ratio was almost directly reversed, as tenants, taken with the building’s appearance, sought to have more of their offices housed in it” (RECORD, May 1970). The reskinned structure (bottom) represents a dramatic transformation from the original concrete building (top, shown in 1969). But the building had an incredible asset—immense floor plates that range from nearly 90,000 to over 120,000 square feet. In recent years, the huge Hudson Yards and Manhat­tan West developments began to go up immediately surrounding 450 West 33rd, while the elevated rail line just across 10th Avenue was transformed into the High Line park. The former warehouse building, which included floors for light manufacturing, came to be seen as a perfect space to attract higher-paying commercial tenants—as soon as something could be done about its exterior. The building’s sloping sides presented several obstacles, from both an aesthetic and practical point of view. Simply allowing the glass to conform to the existing geometry would have made the new building look like a truncated version of the glassy, pyramid-shaped Luxor Hotel in Las Vegas. What is more important, the majority of the perimeter walls were canted at a 20-degree angle. To provide minimum height for accessible paths of travel required by current code—avoiding head-strike conditions—a sizable floor area would be unleasable. Rather than create a stepped-back facade where snow, ice, and bird droppings could accumulate over the narrow horizontal portions, REX, together with facade consultant Front and executive architect Adamson Associates, pushed the glass panels out in a large horizontal pleat so that the pleat’s joint is above head-strike range.